For those working at losing weight, body building or who just want a little extra boost, protein supplements are of major importance to their regimen. However, many protein supplements are hard to take because they just taste nasty. Let’s face it, if your supplement tastes nasty, you aren’t going to be too eager to use it, and you will lose its benefits. The good news is that there are plenty of protein powders with the performance you need and taste a whole lot better than many others. With our buyer’s guide, can help pinpoint protein powder with the features and benefits necessary for the performance you need. Our reviews will examine the various ways these different protein powders implement these high performance ingredients and we’ll even give you an idea of where they rate among consumers when it comes to flavor. Our objective is to give you as much information as we can about selecting a solid performing protein powder as well as steer you toward those which taste better through our reviews. With that in mind, let’s take a closer look at some of the features and benefits of protein powders to keep in mind as you work to select the best one for your needs. The main reason that many people need protein powders is because they cannot consume enough foods to reach the desired protein level they demand. Protein powders have a higher concentration of protein in smaller meal portions to enhance consumption for those who are trying to lose weight, are engaged in body building or have a lifestyle or diet which eliminates many of the foods which are high in protein. What benefits can you expect from protein powder? The benefits you can expect from protein powders vary depending on your overall goal and how you use it. In general, however, protein contributes significantly to the production of enzymes and hormones that are essential to the development and maintenance of muscle, bone, skin, cartilage and blood. Supplementing with protein gives your body a boost in these functions. How is protein powder best used? • Building Muscle. Athletes and body builders have been using protein powder for years to enhance their performance and to help build stronger muscle and bone structure. Protein powders are typically consumed right after a workout to get their best benefits. • Weight Loss. Because many protein rich foods also contain a lot of fat and carbohydrates, those trying to lose weight use protein powder to get this nutrient without fat or significantly reduced fat content. In addition, it can help increase your body’s metabolic burn. • Vegetarian or Vegan Lifestyles. 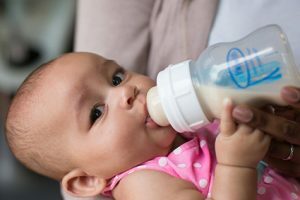 Because those in these lifestyles do not consume meat or animal products, they tend to use vegetable sources of protein to provide a nutrient that is missing in their diets. What are some features or nutrients to look for in protein powder? • Whey. The most common type of protein is whey protein made from the byproducts of cheese making. Whey protein can be classified as whey concentrate or whey isolate. The difference in these is that whey isolate removes fat and lactose to get to a more pure form of protein. • Casein. In the beginning of cheese processing is a state of milk coagulation in which caseins are present. These caseins are separated out to create this type of protein powder which takes longer to breakdown, allowing it to be digested slowly over a longer period of time, like when you are asleep. • Plant Based. Those who are lactose intolerant or vegan, cannot make use of whey or casein protein sources, so they tend to choose plant based protein powders. They tend to work more slowly, are less cost-effective to obtain, and there tends to be a lower number of grams in a serving. The basic plant proteins come from soy, peas and legumes, brown rice isolates, hemp and pumpkin. A caution that men need to be aware of concerning soy protein is that soy is linked low sperm count, erectile dysfunction and various types of psychoses. Most protein powders will include some carbohydrates in low amounts because carbohydrates are necessary for boosting athletic performance and providing a quick boost of energy. Those who are active won’t have any problem burning them off quickly, but those who are using protein powder for weight loss and are not active should opt for lower amounts of carbohydrates. There are two types of fiber: soluble and insoluble. Soluble fiber can be easily absorbed into the blood stream where it assists in the regulation of blood sugar and cholesterol. Insoluble fiber passes more quickly through your digestive system and prevents constipation and other gastrointestinal issues. If fiber is not listed in your protein powder, then you will have to get it from an alternative source, but it is very helpful if it is included on the list of nutrients in your protein powder. Obviously, someone using protein powder for weight loss will want to avoid fat entirely. Depending upon the type of protein used to make the supplement, there will be higher or lower levels of fat included. An optimal level of fat content in a protein powder should be somewhere around 5 grams or less in a protein powder supplement. • Sweetness or Flavor. This is the most subjective portion of taste. Some prefer certain flavors over others and some prefer a certain level of sweetness over others. A moderate sweetness with appealing flavor tends to be the norm. • Mix. How the protein powder mixes into whatever liquid you use it in is one of the criteria that is often measured. You want it to dissolve as much as possible without sticking to the sides and bottom of the blender or your glass. • Texture. This is usually related to how well the powder mixes. If it is clumpy or grainy, protein powder is often a turnoff, so it tends to rate lower where taste is concerned. • BCAAs. In general, branch chain amino acids (BCAAs) help with protein synthesis, aid signaling pathways in the blood, and support glucose metabolism. 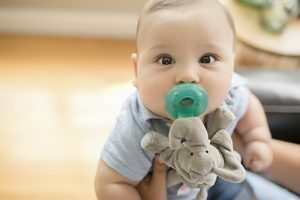 They also help to build immunity and improve cognitive function. • Glutamine. This is also an amino acid which helps in protein synthesis. Your body tends to produce sufficient amounts of glutamine to suit its purposes unless it is under a lot of stress from a heavy workout regimen, performance demands or other types of stress. These general guidelines should help you have a better understanding of the features and benefits of protein powder in general. Moving onto our reviews of several of the best tasting protein powders, you can compare the various ingredients and features in order to narrow down your choice to the one that will work best for you. 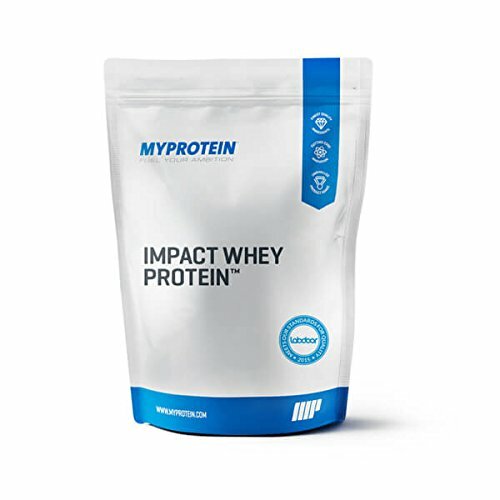 Myprotein Impact Whey Protein is a whey based protein made from grass-fed cattle. A serving of this product includes 21 grams of protein as well as 4.5 grams of BCAAs and 3.6 grams of glutamine. The ingredients of this powder mix easily without clumping and sticking and it comes in a decent array of flavors and is on the upper end of the taste rating scale. • This protein powder mixes well and is easy to drink and is toward the top of the taste scale. • It has a good balance of protein and other nutrients. • The addition of BCAAs and glutamine make it more effective to use. • Muscle building and performance are major pluses of this supplement. • This powder does not contain protein isolates. • The texture is just a little bit off. • You will have to get your fiber elsewhere. You are using protein powder for athletic performance or bodybuilding and need an affordable product. Its texture might turn you off and you need to be careful with its lack of fiber. Six premium protein sources are combined into BSN True Mass Weight Gainer Protein Powder. The protein of this supplement is a whey isolate and does not have any soy. It includes 46 grams of protein along with 10 grams of BCAAs. It has a high calorie intake for those who are trying to bulk up and it mixes well without any chalky taste or texture. • This protein powder is loaded with the necessary nutrients for building muscle mass. • It has the added advantage of BCAAs to help you get the most out of the 46 grams of protein you consume in each serving. • It has decent flavor and mixes well. 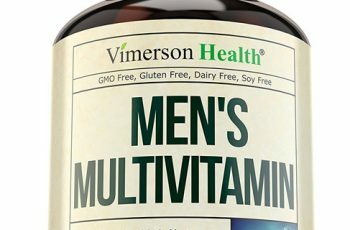 • It does not contain soy, so it is better suited for men. 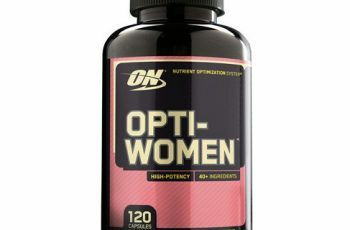 • This supplement is a little bit more pricey than many of the others in our review. • Bloating and diarrhea have been listed as common side effects. • It doesn’t really work for those seeking to achieve weight loss using a protein supplement. You are serious about bulking up and price is really not a concern. If you are using protein powder for weight loss, this is probably not a good choice. 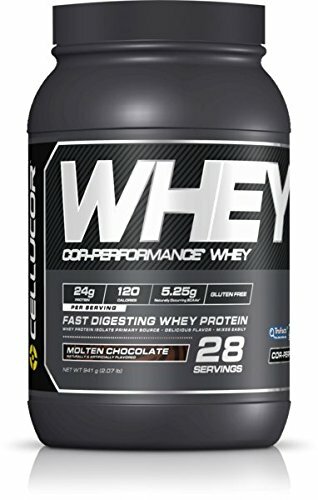 One of the best tasting protein powders on the market comes in the form of Cellucor Whey Protein Isolate Powder. When driving to achieve lean muscle for athletic performance or weight loss purposes, the blend of nutrients in this 24 gram protein powder are a great choice. Carbs and fat are both reduced to optimize protein content in each serving, but includes 3 digestive enzymes to help better metabolize protein as well as other nutrients. It includes some great flavors that are toward the top of the taste chart and it comes with a 30-day, 100% satisfaction guarantee. • This flavorful protein powder is pretty inexpensive per serving. • Its blend gives you a decent amount of protein and is loaded with fiber to help you with weight loss goals and heart health. • Digestion and synthesis are improved with its added enzymes. • It is backed by a money back, 30-day, 100% guarantee. • This supplement contains two questionable artificial sweeteners: sucralose and acesulfame potassium, which can produce the same dangerous side effects as aspartame. • There are some common allergens contained in this supplement. • The sodium content of this protein powder is a bit high. You want an affordable weight loss supplement and are not affected by the allergens contained in this supplement or have issues with high blood pressure. Those trying to build bulk won’t be impressed with this supplement and you need to be very aware and careful with the artificial sweeteners this supplement contains. When it comes to mixing your protein powder, few out-perform this MAN Sports ISO-Protein Isolate Powder. The 28 grams of protein in this supplement come from a whey isolate which eliminates fat entirely. Only 3 grams of carbs are present in this mix, making it almost pure protein nutrition. It is great for quick absorption after a workout and comes with some great flavor choices. • This protein powder has a great blend when it comes to getting more protein without a lot of added ingredients and nutrients. • It comes at a pretty affordable price per serving. • The powder mixes well, does not have a chalky taste and texture, and has a decent flavor rating. • Its whey isolate formula is quickly absorbed for faster post-workout recovery. • The lack of fiber in this supplement should be something of a concern. • It isn’t going to work well for those who are trying to bulk up. You are using protein supplements for weight loss or lifestyle purposes. This is not going to be a good choice for most body-builders. 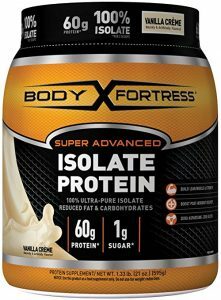 You probably won’t find a protein powder which reaches above the number of grams contained in Body Fortress Super Advanced Whey Protein. This powder packs 60 grams of protein into a serving along with 12 grams of BCAAs to help your body synthesize it. Its higher fat and carb levels also help to build bulk and provide post-workout energy boosting and recovery. It has a decent selection of flavors and its taste rating is toward the top of the chart. • For those who are really serious about getting plenty of protein into their system, you will find it hard to locate a higher amount of protein in any supplement. • The BCAAs included are there to help your body synthesize this massive amount of protein intake. • Its added fat and carbs help with workout recovery and building bulk. 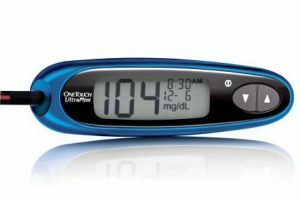 • It is pretty affordable per serving when compared to others in its class. • Though better than many protein powders, it still lacks quite a bit when it comes to taste. • Gas and bloating were common complains with this protein powder. • Its low fiber content is probably not doing your gastrointestinal tract a lot of favors. You are bulking up on a budget. You really need to be careful with the potential gastrointestinal and other related issues of this supplement due to its lack of fiber. 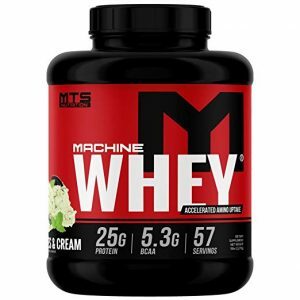 Beating the taste of MTS Nutrition Machine Whey Protein Powder is going to be a pretty significant challenge. This high taste rated supplement contains 25 grams of protein along with 5.3 grams of BCAAs to help your body break it down along with 4.5 grams of glutamine. Its balance of nutrients make it well suited for multiple users with different objectives. It even comes with a broad variety of 19 flavors. 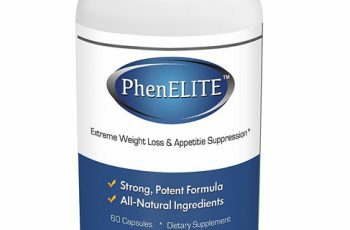 • This supplement has a great multiple use blend. 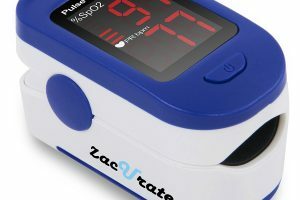 • It comes from well respected industry leaders who are known for stringent testing and quality demands. • The taste and flavor selection are truly amazing. 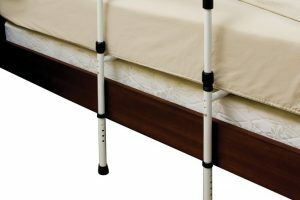 • It is still pretty affordable for those on a budget. • It is a little bit harder to get your hands on this supplement from retailers. • It is not going to bulk you up as quickly as some with higher carbs and fats. You want a great-tasting, well balanced protein powder at an affordable price. If you are trying to build bulk, you probably won’t see results as fast as you might desire. 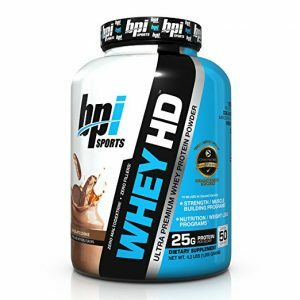 Another decent multiple use blend is found in this BPI Sports Whey HD Premium Protein Powder. This protein powder blends a wide variety of different types of protein to get the best performance and workout recovery available. The higher quality and purity of this supplement comes in 25 grams of protein along with 5 grams of BCAAs to boost its absorption and it comes with enzymes to help it digest easier as well. Its taste rating is among the best protein powders available. • This is a good blend of nutrients for most of the various objectives behind the use of protein powder. • Its combination of protein types along with BCAAs and digestive enzymes makes it easier to digest. • It is still rated toward the top of the charts in taste. • It contains no fillers and no artificial sweeteners. • The fiber content could be a little bit higher. • It probably isn’t going to be a good choice for bulking up. You are using this supplement for workout recovery, weight loss or because of lifestyle objectives. This is not going to be a good choice for those looking to build bulk. 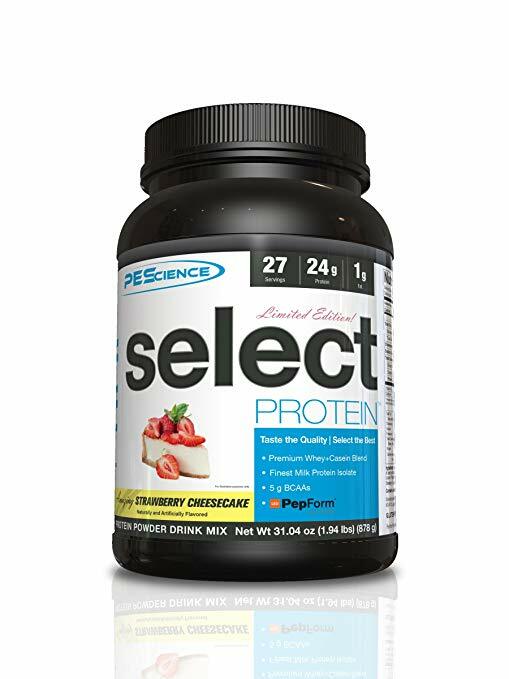 PEScience Select Protein Powder also blends protein types. With both whey and casein present in this formula, you get both fast acting protein for quick workout recovery along with a slower release protein for long-term nutritional supplement. The blend also helps to facilitate better digestion and absorption of protein. This is also rating among the very best tasting protein powders on the market. • This protein powder uses both quick release whey protein combined with slow release casein protein for better overall nutritional benefit. • It has a good balance of nutrients for both athletic performance and weight loss usage. • It has some great flavor options and rates highly when it comes to taste. 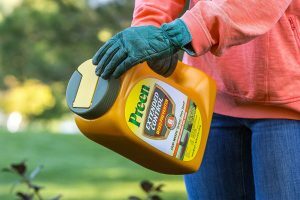 • In spite of its advanced formula, it still comes at a reasonable price. • This protein powder has been known to clump. • It does contain some dangerous artificial flavors. • It is not great for bulk building. You are using this powder for weight loss, athletic performance or a lifestyle choice supplement. The harmful artificial sweeteners should cause you some concern with this powder. A very affordable protein powder option with some great flavor choices comes in the form of Metabolic Nutrition Protizyme Whey Protein Powder. This 25 gram blend has added essential vitamins and minerals as well as digestive enzymes to make using this supplement more effective. It not only helps to create better metabolizing lean muscle, but it helps to satiate your appetite and back off food cravings. In essence, you will feel like you are having dessert when you use this supplement. • This supplement is both a protein powder and a vitamin supplement combined into one formula. • It includes digestive enzymes to help it absorb easier. • You will feel satiated whenever you take this supplement both from flavor and when it comes to reduced food cravings. • It comes with a decent taste rating and with a 30 days, no questions asked, money back guarantee. • The cholesterol content of this supplement might be a concern to some. • It won’t help when it comes to bulking up. You are looking for a solid multi-use supplement with great flavor and affordability. This will not be a good choice for body builders.